The igPivotView is a two-panel control that combines a pivot grid and a data selector separated with a splitter. The view is a composite of three individual components: igPivotGrid , igPivotDataSelector, and igSplitter assembled together to provide in one place as needed tools for manipulating multidimensional (OLAP data) in a pivot grid. Configuration settings that will be assigned to the igPivotDataSelector widget. Configuration settings for the panel containing the igPivotDataSelector. Determines if the panel containing the igPivotDataSelector will initially collapsed. Determines if the panel containing the igPivotDataSelector will be collapsible. Determines the position of the data selector panel inside the igPivotView widget. Determines if the panel containing the igPivotDataSelector will be resizable. Determines the size of the igPivotDataSelector panel. The recommended value is 250px. will automatically size the panel. The panel size can be set in pixels (px). The size can be set as a number. will stretch vertically to fit the parent, if no other heights are defined. Configuration settings that will be assigned to the igPivotGrid widget. Typle="number" Specifies the width of the row headers. Spefies the default sort direction for the levels if no sort direction is specified in an item from the levelSortDirections option. Spefies the default sort direction for the rows. Specifies the sort direction. If no direction is specified, the level is going to be sorted in the direction specified by the firstLevelSortDirection option. Configuration settings for the panel containing the igPivotGrid. Determines if the panel containing the igPivotGrid will initially collapsed. Determines if the panel containing the igPivotGrid will be collapsible. Determines if the panel containing the igPivotGrid will be resizable. Determines the size of the igPivotGrid panel. will stretch to fit the parent, if no other widths are defined. 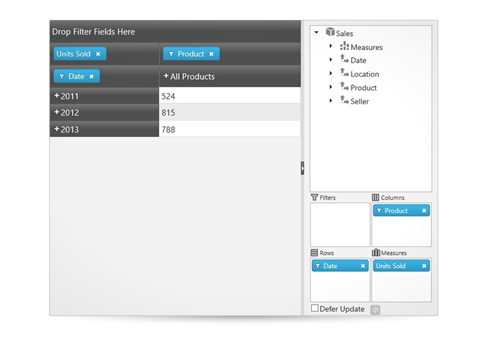 Returns the igPivotDataSelector instance of the pivot view. Returns the igPivotGrid instance of the pivot view. Returns the igSplitter instance used to separate the pivot grid and the data selector. The current widget has no css classes.